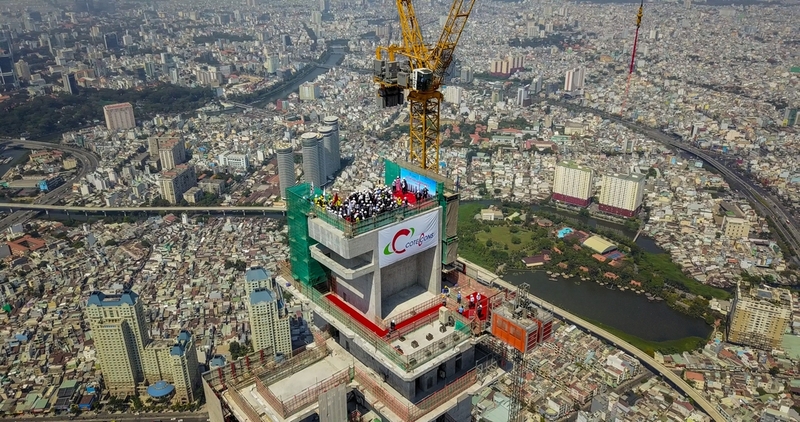 The final steel beam was placed atop the under-construction Landmark 81, a skyscraper being developed in the Ho Chi Minh City-based Vinhomes Central Park urban area, during a topping out ceremony on Friday. The rite, marking the installation of the final piece of structure, was held 46 days earlier than scheduled, its main contractor, Vietnam’s Coteccons, said at the ceremony attended by Minister of Construction Pham Hong Ha. Once completed, the 81-story tower, standing 461.2 meters high, will be the tallest of its kind in Vietnam, and one of the world’s top ten skyscrapers. “Coteccons, a 100 percent Vietnamese construction firm, has beaten other branded and famous international developers to win the tender for this project, which marked a new milestone for the development of Vietnam’s construction sector,” minister Ha said in his remarks. Coteccons chairman Nguyen Ba Duong also said they had never dreamed of the day when a Vietnamese company would be tasked with building an iconic construction for not only Ho Chi Minh City but also Vietnam. Duong said the company takes pride in the fact that the topping out ceremony was held after nearly nine million hours of safe work, with an average construction speed of two to three floors completed a day. “This is why we could reach the topping out mark 45 days earlier than initially scheduled,” he said. Coteccons has had to deploy a number of new pieces of technology and equipment to ensure safety for the construction, especially after its height began to cross the 300-meter mark, according to the chairman. “During construction, we have welcomed visitors who are famous tower developers such as Taisei, Shimizu, Gammon and Jardine, which indicates that Vietnamese contractors are totally able to compete with global peers in major international projects,” Duong said. The Landmark 81 has made Coteccons the first-ever Vietnamese contractor to be listed among 50 global construction companies capable of developing towers taller than 300 meters, according to the chairman. The Landmark 81 now stands behind Dubai’s Burj Khalifa (848 meters) and China’s Shanghai Tower (632 meters), but above Malaysian landmark Petronas Towers (451 meters).